The 4 Series Gran Coupe and S5 Sportback both offer a four-door look blending coupe styling with sporty, six-cylinder performance, but which is the better mid-sized German gran turismo? You either blame or thank Mercedes-Benz, depending on your perspective, for cars like the Audi S5 Sportback and BMW 440i Gran Coupe. It was the Stuttgart company that first abused conventional automotive terms by calling its 2003 E-Class-based CLS a four-door ‘coupe’, starting a trend that has yet to peter out. Yet for executives who have been torn between the practicality of a traditional sedan and the alluring design of a two-door, these body styles seem like the answer to a question they may well have asked. The Audi and BMW five-door hatchbacks – as they are, technically – can’t be accused of cannibalising sales of the A4 and 3 Series on which they’re respectively based. The 3 Series’ 38 per cent year-on-year slump and the A4’s 21 per cent drop in the same period are predominantly down to buyers switching to mid-sized luxury SUVs. 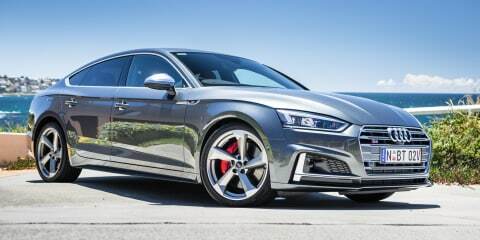 Audi’s S5 Sportback is the newest model, having arrived this year as part of the second-generation A5 range. The 440i Gran Coupe was released in 2014, a year after 4 Series became the new name for a 3 Series Coupe/Convertible, though it has received a small update for 2017. For now, these are the most powerful, sportiest versions of these body styles, though while BMW continues to resist an M4 Gran Coupe, another RS5 Sportback should appear in 2018. German luxury brands have been steadily improving the value of their vehicles in recent years, and Audi is certainly doing its bit with its mid-sized models such as the A4/A5 passenger cars and Q5 SUV. The $105,800 Audi S5 continues the theme of extra generosity with a fully loaded list of standard driver aids: autonomous emergency braking; high-beam assist (so you don’t dazzle other motorists at night); exit warning (so you don’t open a door into oncoming traffic); turn assist (so you don’t drive into the path of oncoming traffic); pre-sense rear (to warn other motorists they’re closing too quickly on your car); side assist (so you don’t veer into a vehicle in your blind spot); cross-traffic assist (so you don’t reverse out of a perpendicular parking spot into traffic). There’s also adaptive cruise control, anti-wandering active lane assist, and a 360-degree camera. An M440i Gran Coupe would be a more natural badge match for the S5, though BMW seems uninterested in an M Performance version of the 4 Series at this stage. That also explains why the 440i looks less overtly sporty than the Audi, despite a standard M Aerodynamics body kit. Our test car’s extra-mature Adventurine Red Individual paintwork ($5700) probably doesn’t help. The BMW isn’t far off in price, costing from $101,300 before on-roads. It doesn’t have quite the extensive range of driving assistance technology as the Audi, though neither is it a million miles off, with AEB to help avoid hitting cars or pedestrians at low speed, surround view camera, lane change and lane departure warning systems, and (signpost-reading) speed limit information. And the 440i matches the S5 for adaptive multi-speed cruise, adaptive LED lights including high-beam control, front and rear sensors plus reversing camera, and the ability to steer itself into a parking spot. The BMW leads on the sound front with a 600-watt Harman Kardon system compared with the Audi’s own-brand 180-watt audio, while the 440i includes a head-up display and speed-limit information as standard. You need to increase your S5 spend by $5600 for a Technik Pack to bring an HUD, and a 755-watt Bang & Olufsen audio – plus the clever, night-almost-becomes-day Matrix LED headlight system. It’s a bit of a stalemate for pricing and features, then – a situation that extends to exterior embellishments. Both wear sportier body kits and 19-inch wheels, with our S5 test car switched from a five-spoke to five-arm ‘turbine’ design ($1100) with same-size rubber (255/35). There are also sports suspensions and coupe-style frameless doors all round. There’s an interesting battle inside, where the S5 Sportback and 440i Gran Coupe cabins mirror the respective sportiness and conservativeness of their exteriors. Our 440i’s optional ($2000) Opal White piped and cross-stitched leather upholstery and trim are quite beautiful to both sight and touch, if susceptible to dirty marks. The Audi’s sports seats look racier (and not just because they’re red), and the sportier feel is enhanced by faux-carbon-fibre panels and Alcantara trim. The Audi and BMW share invitingly supple leather sports seats with heating and multiple electric adjustment (including lumbar and bolstering), leather-bound sports steering wheels and keyless entry and engine start. Audi’s climate control extends to the rear seat, whereas BMW’s is a front dual-zone only. Jump into the seats rather than the specs, and more advantages are found for the car from Ingolstadt rather than Munich. Firstly, you seem to sit deeper in the S5’s Bentley-style, diamond-patterned seats, generating a greater sense of sitting in a coupe-style car whereas the BMW feels like you’re just in a regular sedan. The materials quality and switchgear tactility also look and feel a step ahead of the BMW’s (you need to sample the new 5 Series to discover BMW’s belated response to Audi’s long run of class-leading interiors). Audi presents the driver with a full graphical instrument cluster (Virtual Cockpit) that can change colours and displays like neon billboards on a Tokyo street. The BMW goes halfway, featuring configurable graphics that can be altered within physical dial rings. Both styles are likeable, though the BMW’s display tends to leave a void of blackness on the graphic panel between the dials that seems a waste of space, while there’s no digital speedo unless you’re in Sport mode. Over to the bigger digital displays, the 440i’s infotainment screen wins the size war at 8.8 inches to 7.0 inches. It features the latest-generation iDrive (No.6), now based around a tile system and still the leader for presentation and intuitiveness. We continue to enjoy the BMW’s dual-display navigation map too, though there was an occasion when it led us down a garden path – or at least a side street it suggested was a short cut, but instead ended with a no-entry sign that forced a frustrating about-turn. Just can’t seem to beat Google Maps. You can have Apple Maps as standard on the Audi via its smartphone-mirroring interface – BMW asks $623 to add Apple CarPlay. Both cars bring digital radio and internet connectivity via WiFi hotspots. Storage is a clear win for the S5. Although the 440i features sizeable front door bins, the glovebox is averagely sized, the console bin is almost made irrelevant by the ‘snap it’ phone adaptor, and with just two cupholders and a small rubber tray on the centre console there’s no natural place for keys or a smartphone. The Audi’s console bin solves that problem, even if it’s more like a deep tray. There’s also a specific nook for the car key. And whereas the S5’s rear doorbins can accommodate a 600ml bottle, you can’t squeeze one into the BMW’s bins. There’s also a surprise and delight with the Audi’s rear centre armrest, which in addition to a carpeted square tray features clever, funky-looking dual pop-out cupholders with two size settings. Rear passengers also benefit from grabhandles, and head room that is less likely to compromise the comfort of a 5ft 10in adult. Knee space is otherwise similar, with foot space marginally better in the Audi. The Germans are united in their approach to 40-20-40 rear seatbacks and two ISOFIX anchor points. The same with auto tailgates, which access similarly (and usefully) shaped boots sharing a 480L capacity. The Audi has LED boot lighting and offers more options for keeping items tied down – whether by multiple elastic straps and net sections – though the BMW provides extra underfloor storage courtesy of its run-flat tyres instead of a space-saver spare like the S5. There’s unanimity here on cylinder count (six), engine capacity (three litres) and the employment of a single turbocharger, though the S5 sticks with a V6, while the 440i adheres to BMW tradition with its pots all lined up in a longitudinal row. Audi’s six-cylinder is the stronger – doling out 260kW and 500Nm compared with the BMW’s 240kW and 450Nm. Mass doesn’t come into the equation as both models tip the scales at 1615kg. The Audi seems to deliver speed more effortlessly through the gears as well, though while there’s a sense you need to work the BMW’s accelerator pedal harder for performance, it doesn’t feel slow by any means. Yes, we still reminisce about the normally aspirated BMW straight-sixes of yore, but the car maker’s sixes have been great since the 2007 335i heralded the brand’s new era of all-forced-induction engines. The 440i’s B58 engine, part of BMW’s modular family, maintains its maximum torque 500rpm higher than the Audi (4500rpm v 5000rpm), and it provides an ever-deepening growl as revs climb with supreme smoothness. Audi’s V6 has a contrasting character: more theatrical, seemingly eager to please you more of the time, with an enjoyably raspy note as you explore its upper rev range. Which sounds the best will be in the ear of the beholder, though there’s a greater authenticity to the BMW’s motor. The German rivals also agree on eight-speed torque converter transmissions, wisely (in our view) keeping clear of the trendier dual-clutch autos that shift faster but are prone to low-speed hesitancy. Both are superb autos, providing seamless shifts perceptible only by the change in engine note and capable of sufficiently fast cog-swaps in faster-paced driving. The top gears also ensure effortless freeway cruising, with the BMW fractionally more relaxed at 110km/h – 1600rpm versus the S5’s 1650rpm. BMW’s longer-stroked six will save you almost a litre of premium unleaded per 100km, with official consumption of 6.8L/100km trumping the Audi’s 7.7L/100km. While a buyer of a circa-$100,000 car may not be too concerned by the difference in cost, they would be interested to note that the 440i’s theoretical range will give them an extra 129km between fills (882km v 753km). Testing conditions played beautifully into the S5’s hands. Damp roads presented the Audi with a traction advantage the BMW was never going to overcome. Whereas you could tramp on the S5’s throttle early and savour the propulsion out of corners, the BMW is a game of patience on moist surfaces – though there’s fun to be had seeing the 440i’s traction-control light flickering even after you’ve reached fourth gear after accelerating out of a hairpin. Along an entertainingly twisty road, the BMW’s pace deficit was also compounded by brakes that didn’t engender the same feel and confidence as the Audi’s. Our S5 was also equipped with an optional ($2950) quattro Sport diff that shuffles torque between the rear wheels to help limit understeer. Yet speed isn’t everything, and there’s a profound driving pleasure to be derived from the 440i. While there’s much to admire about the way the S5 limits body lean as it negotiates corners, the way the BMW squats onto its outer rear wheel as you tip the 440i into a bend is hugely satisfying. Both cars are tied down impressively across bumpy bitumen when their adaptive dampers are switched to stiffer modes (Dynamic and Sport, respectively), but the BMW’s steering is the most satisfying – whether on country roads or in the suburbs. While it doesn’t impart the kind of feel we’ve missed in the 3 Series since the E46 generation was phased out, it’s more responsive than the S5’s relatively (and surprisingly) slowish rack. The Audi’s wheel also struggles to offer meaningful heft in Dynamic mode, though at least the weighting is consistent – which is something that couldn’t be said before about many Audis in the recent past. It’s also utterly accurate, and there are times when it’s isolation works in its favour. The BMW’s steering tends to tramline, if most noticeably on country roads – moving the wheel in your hands when you encounter changing cambers or ridges in the bitumen. You wouldn’t expect pillowy-soft rides from an Audi wearing an S badge or a BMW featuring an M Sport package, though neither do they ask discomforting compromises in return for their sporty handling. There’s little to choose between them in this respect. The Audi seems more effective with its damping set to Auto mode rather than Comfort, and it will give its bump-stops a clout over big potholes where the BMW cushions. The BMW’s low-speed ride can be knobbly without being annoyingly busy – a trait we’d put down to the run-flat tyres that continue to create an inherent stiffness to the ride, yet are much improved on the earlier rock-hard-sidewall generations of this rubber. The 440i edges noise refinement. Wind rustle is slightly less noticeable on the freeway in the BMW, while our cabin noise test – conducted on a country road at 100km/h – recorded an average 91.5dB for the BMW compared with 92.4dB for the Audi. Both cars offer excellent turning circles. You could buy a coupe style, six-cylinder, four-door car loaded with features for just $60,000: it’s called the Kia Stinger GT. As good as the new Korean is, however, the superiority of the S5 and 440i engines, transmissions, steering, interior quality, and country-road compliance ensure you’re not paying more than $40,000 just for a badge. It’s harder to split the German duo. Like boxers sparring with a flurry of jabs, the S5 and 440i trade pros and cons in so many areas. Both offer endearingly excellent drivetrains, neither greatly compromises ride comfort in return for its enjoyable dynamics, and refinement levels are similar. Visually, the S5 is properly sleek whereas the Gran Coupe looks more like a sedan with a tapered roofline. 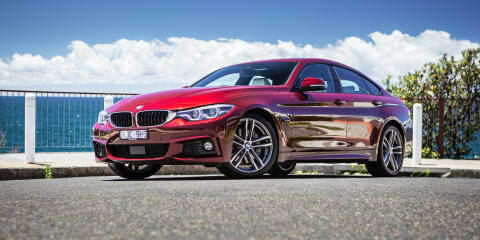 And our BMW in Adventurine Red looks more grandad than Gran Coupe, though this is easily fixed by switching to one of the new 4 Series colours, such as Sunset Orange or Snapper Rocks Blue. With one of those hues, both our testers would opt for the 440i. But comparison victories are based on subjective measures rather than personal choices. The Audi looks and feels more special inside, while it extends its cabin leadership with better practicality – more storage options, more rear head room. Combine that with its enjoyably accessible all-weather speed, and the Audi S5 edges a tightly fought contest between two excellent German gran turismos.